1. Paraganglioma is one of the differentials of intradural extramedullary spinal masses. 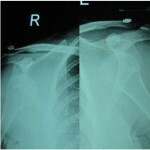 2.Presentation and management of a paraganglioma lesion of the cauda? P.E.S. Institute of Medical Sciences & Research Kuppam, Dist. Chittoor, Andhra Pradesh, India. Introduction: Paraganglioma is benign and slow growing neuroectodermal tumor commonly found in the adrenal medulla, carotid body and glomus-jugulare. Paraganglioma of cauda equina is relatively rare. Case Report: We report a case of paraganglioma of the cauda equina region in 60 year lady who underwent successful surgical resection. Clinical presentation and imaging appearances of paraganglioma involving the spine is nonspecific and most of the time diagnosis is on post operative histopathology. Few MRI features and contrast MRI can be helpful if paraganglioma is suspected. Conclusion: Paraganglioma should be kept in mind as the differential diagnosis of extra medullary tumor contracted in the cauda equina region. Catecholamine secretory paraganglioma is uncommon but preoperative screening for hyper adrenergic state is necessary to prevent hypertensive crises during tumor removal. Paraganglioma is benign and slow growing neuroectodermal tumor commonly found in the adrenal medulla, carotid body and glomus-jugulare . Paraganglioma of cauda equina is relatively rare, only a few 100s of cases are being reported in literature[1,2,3]. We report a case of paraganglioma of the cauda equina region who underwent successful surgical resection. A 60year old lady presented with low back pain for a period of 1year. The pain was continuous, nagging and radiating down to her right foot. There was no complains of bowel or bladder disturbances. No past history of trauma, diabetes, hypertension or antitubercular medications. On examination, she had local tenderness in the lumbosacral region. Spinal curvature was normal. 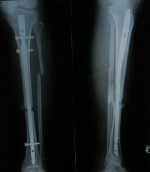 Femoral stretch test was positive indicating a lesion around L3-4 root. Neurological examination revealed sensory deficits in the distribution of L3-4 region of the right leg. The plain X-ray of the lumbosacral region was normal. The MRI of Lumbosacral spine showed a mass 2.1×1.03cm sized space occupying lesion isointense to cord, extra medullary intradural lesion at the level of L3 vertebral body (Fig 1a & b). A diagnosis of intradural extra medullary lesion was made. Possibility of meningioma, schwannoma was considered in the differential diagnosis. She was posted for laminectomy at L3-4 level for tumor resection. 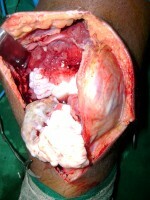 Intraopeatively the tumor -a red encapsulated and firm mass found attached to a nerve root at L3 level. It was soft, grayish purple in colour and moderately vascular. Cut section showed grey brown with grey white area. The postoperative course was uneventful with complete disappearance of pain and the neurological examination was normal. 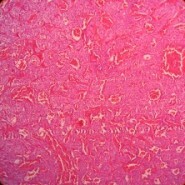 Histopathology examination of the encapsulated lesion showed tumor cells arranged in a well defined nest of organized pattern (“Zellballen”Fig-3a) separated by thin vascularized stroma Fig-3b). Paraganglioma is tumor derived embryologically from autonomic nervous system commonly from adrenal medulla or occasionally from extra-adrenal paraganglion system.These is collections of neural crest derived, neurosecretory and chemoreceptor cells of the autonomic nervous system belonging to a ‘diffuse neuro-endocrine system’ or the APUDsystem (Amine Precursor Uptake Decarboxylase)  with the possibility of hormone secretion (Adrenaline, noradrenaline and dopamine) .Paraganglioma of CNS is a very rare finding. The first reports dates back to 1970 by Lerhman and Kaplan . In the cauda equina region, they may arise from paraganglia located in the cauda equina, but it has also been suggested that some constituents of the diffuse neuro-endocrine system can be the result of a local differentiation from tissues not derived from the neural crest, and the participation of the ependymal cells in their development cannot be excluded  explaining the reason for the non-secretory type.It’s more common in male subpopulation and the mean age of presentation is from 13 to 70 years (mean age= 48, 45 years). Patients commonly present with low-back-ache with radicular pain as in our patient. Although the clinical presentation and imaging appearances of paraganglioma involving the spine is nonspecific. Paraganglioma should be kept in mind as the differential diagnosis of extra medullary tumours contracted in the cauda equina region. Catecholamine secretory paraganglioma is uncommon but preoperative screening for hyper adrenergic state is necessary to prevent hypertensive crises during tumor removal. 1. Yang SY, Jin YJ, Park SH, Jahng TA, Kim HJ, Chung CK. Paragangliomas in the cauda equina region: Clinicopathoradiologic findings in four cases. J Neurooncol 2005; 72:49-55. 2. Aghakhani N, George B, Parker F. Paraganglioma of the cauda equina region-report of two cases and review of the literature. Acta Neurochir (Wien) 1999;141:81-7. 3. Gelabert-Gonzalez M. Paragangliomas of the lumbar region. Report of two cases and review of the literature. J Neurosurg Spine 2005;2:354-65. 4.Araki Y, Ishida T, Ootani M, Yamamoto H, Yamamoto T, Tsukaguchi I, et al. MRI of paraganglioma of the cauda equina. Neuroradiology 1993;35:232-3. 5. Taira H, Takasita M, Yoshida S, Takita C, Tsumura H, Torisu T. MR appearance of paraganglioma of the cauda equina. Case reports. Acta Radiol 2000;41:27-30. 6. Harrisons’s principles of internal medicine, 17th edn. McGraw-Hill, New York, Chap-337.